It's busted with Windows 10 update. Best to uninstall this pos. Some had to uninstall then reinstall. Did you try that? Just upgraded to Win 10 Pro (1803) from Win 7 Ultimate. 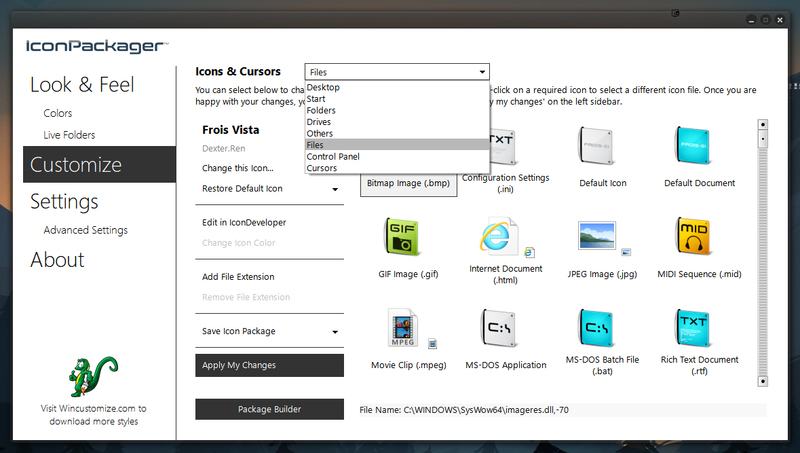 I can not use Icon Packager (like I could with Win 7) to change and individual file icon. When I had Win 7 installed I could use Icon Packager to change the icon of an individual file (i.e. Working.accdb (MS Access)). Now (in Win 10) when I run Icon Packager I can not find where I can change a individual file icon. Am I missing something. I like the ability to change a group of icon and one type, but I really want the ability to change a individual icon (regardless of the extension it has, like [.accdb, .pdf, .zip, .docx, .exe, etc]. Meanwhile you are beta testing your Windows 10. Seriously, the 'pos' is the OS. Microsoft cannot even keep their 'Edge' functioning - and that's NOT a third-party program. Have uninstalled and reinstalled. Didn't fix problem. Any other suggestion(s)? If you click on Customize at the top choose what category you want to change. Ex. choose Files highlight what file type you want to change and to the left click Change this icon and choose your icon. If you like the package you changed at the bottom select Save Icon Package and name it the same or what I do is name it the same and add a 1 at the end so it doesn't overwrite the original. Yeah MS is a POS also. Didn't realise they were still beta testing their OS couple of years after first releasing it when I installed Win10. I have selected "Customize" and from the drop-down I selected "Files" but my only shows that I can change a group of extensions like .cab, .png, and not a individual file like "ChristmasHome.png" or "Baseball.accdb" etc. If my memory serve me right, I could change the icon for any particular file in Win 7. I thought I had the option to change any file icon, where it be an .exe, .zip, .jpg, .xlsx, or any file etc. I can change the folder icon, but not the file(s) inside the folder. If I make a shortcut and add to my desktop, then I can change the icon. When I open Window Explorer, I can only change the folder and not the file(s) inside the folder. Were you using IP 5 rather than IP 10 when on Windows 7? I've never tried this, but if you choose to change a file to the left it says Add File Extension. If it's not in the list you can add one by selecting New then apply and icon to it. You are right you can change a shortcut icon by right clicking on it, but to change an actual file it must be added to IP. cmd winver shows ,it's Win 10 Pro (1803). After installed iconpackager , once i run this app the pc just crushed immediately. I can't even uninstall it , it crushed too. And this is why Edge has little to no market share. If one software has problems under Windows 10 it should not be advertised as Win10 compatible. I never had problems with any software on Windows 10 since I installed it on 2015 release day, except with StarDock apps.